First and foremost, it is important to understand that being fearful or anxious about going to counseling is completely normal. It can be strange to sit down with a seemingly stranger and immediately start talking about all the intimate details of your marriage – especially the bad stuff. Going to counseling also means you are admitting there is a problem and that something needs to change – which many men don’t want to admit. We also see husbands refuse therapy because they want to control their spouse and the relationship, which can be quite dangerous. Even though the thought of counseling may be intimidating, if your husband truly wants to save your marriage and improve your relationship, he will eventually agree. If your husband is refusing to go to counseling with you, there’s a good chance you will feel betrayed, unwanted, or alone. The last thing you want to do is push or force your partner into counseling, as this could make the problems you are having even worse. So, what do you do? To start, it may be a good idea to go to counseling alone and talk about your feelings and your spouse’s rejection with a professional. They will have good tips for you on how to encourage them to come and work together on your problems, instead of leaving you to figure it out on your own. If your husband is refusing to go to counseling with you, make sure you talk openly with them about how this makes you feel. Feelings of rejection that come along with this can quickly escalate, leading to more serious problems than what you are dealing with. Talk to your spouse and tell them how this makes you feel. We often find that husbands are able to gain a better understanding of where their spouse is coming from and will agree to go with you. Traditional marriage counseling isn’t for everyone, and that’s OK. 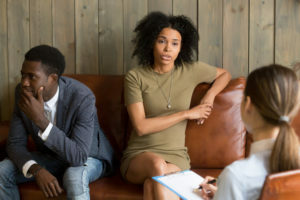 Even though we have successfully helped many couples at our Carrollton marriage counseling center, we also understand that it doesn’t always work. If your spouse is still super opposed to therapy, try suggesting an alternative like meeting once a week or every other day to discuss your feelings. Simply making a point to spend quality time together and validate one another’s feelings can be extremely beneficial. Listening to your spouse and making an effort to understand where they are coming from will go a long way, especially if your husband is struggling with the idea of marriage counseling. We encourage you to give Lifeworks Counseling Center a call and schedule an appointment with us, even if it is just you to start. We will offer you advice on how to proceed and give you best practices for protecting yourself while trying to get your spouse to understand how beneficial counseling can be.